All courts of appeals are cited as Tex. App. 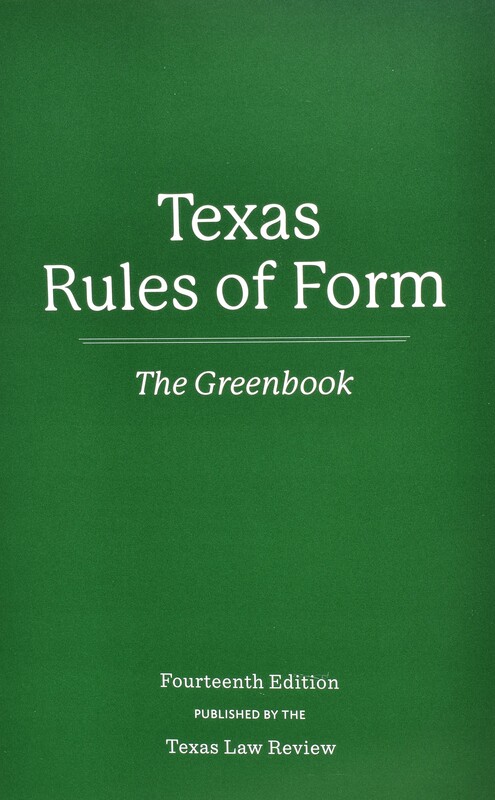 A new edition of Texas Rules of Form—The Greenbook—just came out in August. The 14th edition has some changes you’ll want to know about if you cite Texas authorities. I summarize the key changes below. But first, why change The Greenbook? 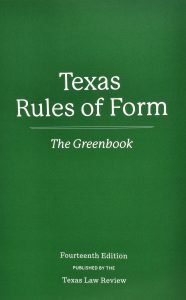 The Texas Law Review editors in charge of the 14th edition were determined to improve The Greenbook and to address concerns raised by practicing lawyers, law librarians, and legal educators. So they created an extensive online survey that asked about nearly every citation convention in the manual; the survey also solicited suggestions for improvement. They received hundreds of responses and ultimately made several changes intended to improve the manual. Here are the main changes. The first thing you’ll notice is the look of the text, which I consider an improvement. The 14th edition uses a contrasting font for major headings and examples and places rule numbers in the left margin. These design elements make the text easier to read and easier to skim. For all intermediate appellate court cases, the correct abbreviation for the court is now Tex. App. because the 14th edition has abandoned Tex. Civ. App. See Rule 4.2. In case you’d forgotten: before September 1, 1981, Texas’s intermediate appellate courts had no criminal jurisdiction and heard only civil cases. They were known as courts of civil appeals and were abbreviated Tex. Civ. App. After these courts gained criminal jurisdiction, they became the courts of appeals, and in a full-citation are abbreviated Tex. App. The 14th edition has done away with this distinction, so all courts of appeals are cited as Tex. App. When citing a Texas statute in full form, The Bluebook and previous Greenbook editions require you to include a parenthetical containing the publisher (West) and the date (the copyright year of the print volume in which the statute appears). But the 14th edition does away with that requirement. See Rules 10.1 and 10.2. For statutes currently in force, the 14th edition drops the publisher-date parenthetical. Now, if we could just get The Bluebook editors to be similarly sensible. This is another sensible change. Ultimately, I like the new Greenbook, and I approve of the editors’ changes. Here’s hoping you’ll approve, too. This entry was posted in Citation on October 15, 2018 by Wayne.